There is no right or wrong potting mix for growing catasetums. Whatever mix you choose, you will adjust your watering and fertilizing practices to accommodate the requirements of the plant. Here are some suggestions that have worked for us. 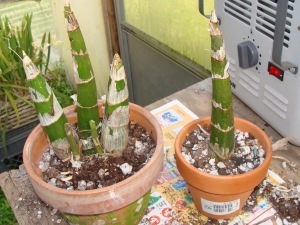 Stephen's Repotting Practices. 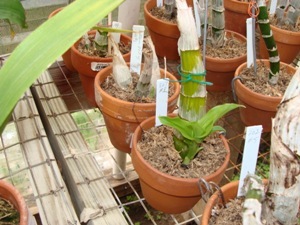 Stephen grows his plants outside in Houston under a large shade house covered with 60% shade during the growing season. He brings them into the greenhouse when the weather turns cold and they begin their dormancy. 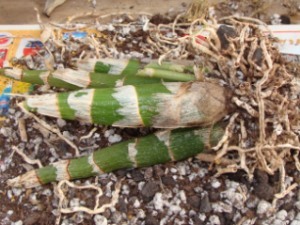 Plants are divided and repotted during the fall and winter but not watered until the growth is well established. He uses a mix of one part large sponge rock, one part medium charcoal, and one part peat moss. The pots are top dressed with a sprinkle of time release fertilizer and a thin layer of sphagnum to keep the fertilizer from splashing out. All catasetums are potted in clay pots because they dry out faster so they will not be lost to rot whenever we have those months of rain every day for weeks at a time. Repotting Catasetums. Wait until your plant enters dormancy to repot. First the leaves turn yellow and fall off. 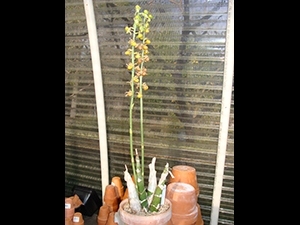 Then you can divide the catasetum and repot the bulbs one or two inches below the rim of the pot. Use a dry mix only and do not water. Once the plant has developed a new lead, spread a thin layer of time release fertilizer and wet sphagnum moss on top of the mix. 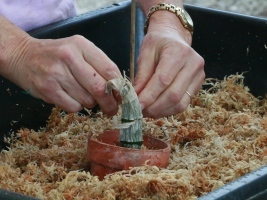 The moss is used to hold the medium and fertilizer in place when it is time to water. 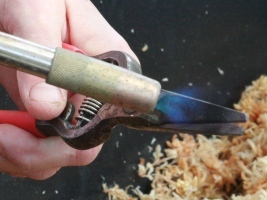 DO NOT WATER until the new lead has developed leaves that are two to three inches across. ONLY THEN is it time to start watering. Sue's Repotting Practices. Sue grows her catasetums in a greenhouse in North Florida. The greenhouse is covered in 50% shade cloth and an extra 30% cloth layer is added in March and removed in October. The catasetums hang on poles in the highest part of the greenhouse above the cattleyas so they get bright bright light. Plants are divided and repotted after entering dormancy into sphagnum moss with some spongerok added. Time released fertilizer is interlayered with moss to provide the extra nutrition these heavy feeders crave. Potting Mixes. If you can control the amount of water your plants receive, high quality sphagnum moss is a good choice for potting catasetums. The moss has a life of one to two years, but if you repot them annually, degradation of the potting mix is not that great of a concern. The sphagnum holds plenty of the moisture your catasetums need during their spring and summer growth spurt. If you are growing outside where you cannot control the rainfall your plant receives and you are prone to tropical storms or week long rainy periods, you will have have to lighten your mix by adding sponge rok, charcoal, hydroton or a similar inert material to the sphagnum moss. Outdoor growers may also select a more freely draining mix so plants don't rot during extended rainy periods. Soil-less mixes containing peat blended with sponge rok and charcoal are a good choice. 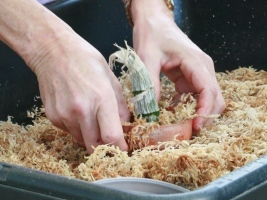 Make sure you have a time release fertilize like Dynamite handy when you are repotting because you will interlayer this with your potting mix to make sure the plant has plenty of fertilizer during the growth season. Repotting Catasetums. 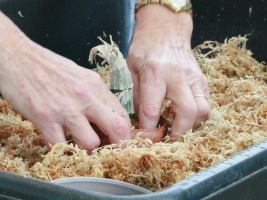 Inspect your dormant plants regularly during the November to March time period. 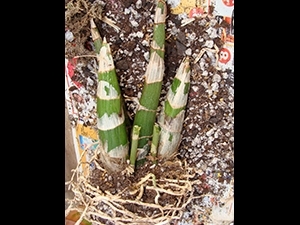 You can repot after they have entered dormancy or wait until they are just sending up a new growth. Don't wait any longer, you know the growth cycle is beginning and it is time to repot. 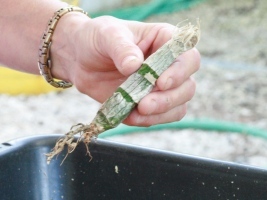 Remove the plant from the pot and cut most of the old roots off. 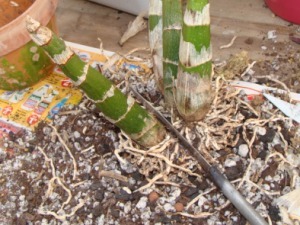 Leave enough of the old dead roots on to stabilize the plant, say a half inch or so. 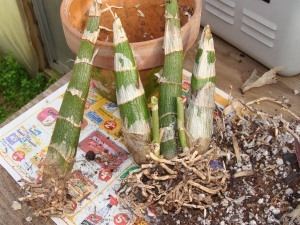 If you wish to divide the plant, old back bulbs can be cut from the plant and repotted. They will send up a new growth in a month or so. Interlayer Potting Mix and Time Release Fertilizer. 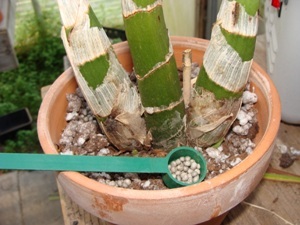 If you are using a standard sized pot (as opposed to an azalea pot) or the plant is small, add a few styrofoam peanuts to the bottom of the pot. 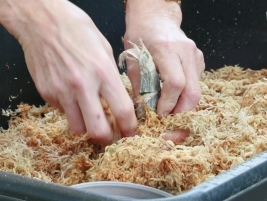 Then start layering in your moist sphagnum moss or other potting mix, some time release fertilizer, more sphagnum moss/potting mix and another sprinkle of time release fertilizer. 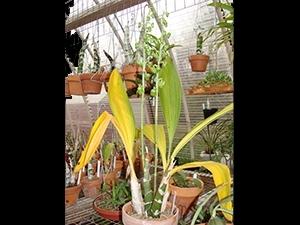 Set the plant slightly below the top of last year’s growth and position the new growth in the center of the pot. 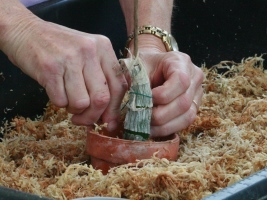 Continue packing the potting mix around the plant being careful to keep the moist moss/mix away from the new growth. Top dress with a final sprinkle of time release fertilizer. 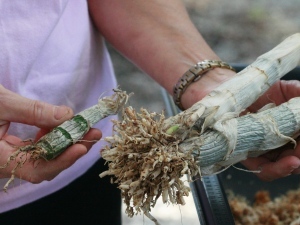 Tie the old bulb to a short stake to stabilize it. 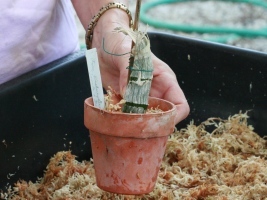 Return you plant label to the pot and move the plant to a warm growing area where it will get moderate light. 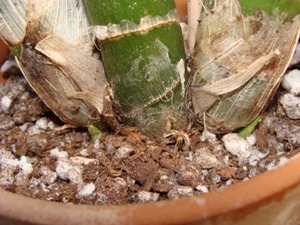 Do Not Water after Repotting. DO NOT WATER AT THIS TIME! As much as this is counterintuitive, your new growth will rot if you water at this time. Catasetums have plicate leaves that unfurl as they grow. 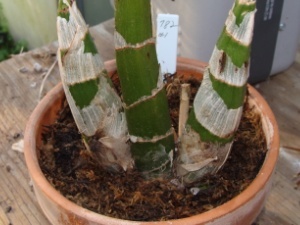 Any small amount of water entering the whorled leaf will rot the new growth before the leaves can unfurl. Wait until the new growth is 4 or 5 inches tall. Only then is it safe for you to water your plant. Backbulb Propagation. Share your plants! 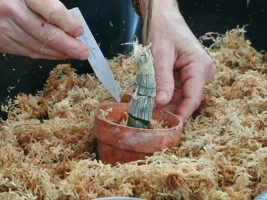 Separate older bulb(s) from the main plant, pot in sphagnum moss or your mix of choice interlayered with time release fertilizer, stake the bulb and reinsert plant tag. Always sterilize your cutting tool after use.